Ladybones was a refreshing take on mental health and the process of recovery that invited the audience to understand the reality of life with OCD (Obsessive-Compulsive Disorder) and depression without it ever seeming an afterthought to conceal any cracks in the script’s authenticity. The play followed Nuala’s life as an archaeologist following her discovery of a young girl’s skeleton, her own search for identity and recovery slowly entwining with the remains. Sorcha McCaffrey’s performance as Nuala directed by Lucia Cox was endearing throughout. There was a constant sense that we were watching her character organically filter through memories, daily events and thoughts rather than a scripted performance. The small venue of the King’s Arms in Salford lent itself to the play’s intimate appeal and worked exceptionally well with McCaffrey’s solo performance, having no elaborate stage or props to distract from her character’s endearing nature. 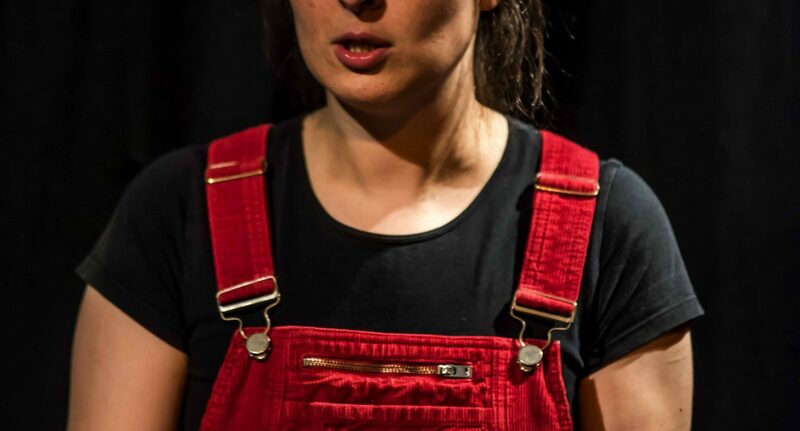 As the audience began to take their seats, McCaffrey bounced over in her red dungarees, introducing herself in character and asking our names one by one. We were offered a yellow sticker to opt-in during moments of audience participation. She reassured us that this was optional and that we could otherwise “chill out”; this calm invitation rather than uncomfortable obligation being the start of the play’s informal yet captivating experience. As McCaffrey continued to search the crowd with bulging and flickering eyes and a beaming smile on her face, it became increasingly apparent that we were not about to experience an hour’s worth of passive theatre lecturing us about the obvious problems of mental health disorders, but more so invited to participate and reflect upon a person’s story. Ladybones’ depiction of mental health disorders refreshingly had no intent to distress or shock us, but to give us brief insights into the numbing reality of depression, the all-consuming anxiety of OCD. This is not to say that there weren’t uncomfortable flickers of insight into Nuala’s mind, but the play’s fundamental intent seemed to be trying to expose the bare bones, trying to make sense of the world around her. There was not a single moment in the play in which I felt that her character had been reduced to her mental health disorder. This cannot be said for many other plays that have attempted to deal with the same subject matter that I have seen prior to this. I was apprehensive before seeing this play due to its partnership with the national charity OCD-UK that the production could have fallen into the classic pitfall of feeling obliged to make mental health the focus of the piece. Refreshingly, Ladybones successfully balanced a realistic depiction of the daily impacts of Nuala’s disorders without overpowering the focus on her human experience. In doing so, the play ardently avoided being yet another bleak, exploitative, and distressing depiction of suffering, but an acknowledgement of its difficulties with hope for recovery. McCaffrey’s performance was peppered with comic anecdotes and witty observations of the mundane, her multi-roleplaying as her therapist leaving the audience in ruptures of laughter. McCaffrey’s authentic delivery of Nuala’s wit in illuminating proverbial mundanity with a beady eye for detail and fragments of poetic observance, mean the play was surprisingly hilarious, considering its not-so-hilarious subject matter. Overall, Ladybones was an uplifting search for identity that acknowledged the grinding salt of daily tribulations from awkward sexual encounters to the blinding ache of loneliness without ever losing hope. It was nice to see an exploration of mental health that did not try to give its audience answers or solutions, but a reminder that life cannot be read as easily as the maps of a medieval skull’s cracks and dents.